At least $2.2 billion is needed for humanitarian assistance in the region spanning Nigeria, Niger, Chad and Cameroon, but only $460 has been delivered, said Jan Egeland, secretary-general of the Norwegian Refugee Council. Six months after donors at the Oslo Conference committed funding for humanitarian support in the Lake Chad Region with nearly 800,000 severely malnourished children, only 57 per cent of the funding has come in. “Lack of sufficient humanitarian funding is putting young children’s lives at risk,” warned Egeland. “The donations from the Oslo conference have been crucial, but we are not able to avert a massive loss of lives without large additional funding for our humanitarian operations in the conflict-ridden areas. We need improved security for civilians and aid workers, and access to all those in need, but we must also build a bigger humanitarian muscle that can provide for the suffering millions,” said Egeland. Boko Haram violence has spread to Nigeria, Cameroon and Chad, causing violent confrontations with security forces and forcing people from their homes. Many are unable to cultivate their land, causing a food crisis. In Nigeria 5.2 million people now remain food insecure, including 50,000 who are already living in famine-like conditions. “We fear that we only see a portion of the massive needs, as large areas remain inaccessible for humanitarian organizations,” said Egeland. A consultative group for Lake Chad consisting of representatives from Germany, Norway and the UN, in addition to the four countries surrounding Lake Chad, will have their first meeting in Berlin on Wednesday, 6 September. The Norwegian Refugee Council has stressed humanitarian funding and access should be top of the agenda. “Inadequate funding is currently hampering our ability to deliver timely and life-saving assistance to people in need. Before this is put in place, there will be no hope and stability in the region,” Egeland said. •Close to 800,000 children under the age of five are suffering from severe acute malnutrition in the Lake Chad region, including 450,000 in Nigeria, 247,500 in Niger, 63,000 in Cameroon and 22,000 in Chad. 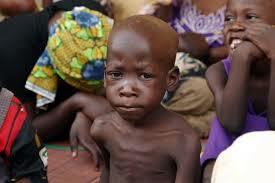 •At the same time last year, 475,000 children suffered from severely acute malnutrition in the region. •In Nigeria, at total of 5.2 million people are food insecure, and 50,000 are already living in famine-like conditions. •At the Oslo conference for the Lake Chad Basin on 24 February, 14 donors pledged $672 million for Cameroon, Chad, Niger and Nigeria, of which $460 million was for 2017. So far, 84 per cent of this has been disbursed. •In total there is a need for more than $2.24 billion to meet the urgent humanitarian appeals for the region in 2017. Of this, more than $1.27 billion or about 57 per cent is still lacking. •Tomorrow, The Oslo Consultative Group on the Prevention and Stabilization in the Lake Chad region is meeting for the first time in Berlin.